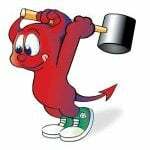 A. FreeBSD services can be controlled by updating /etc/rc.conf file. 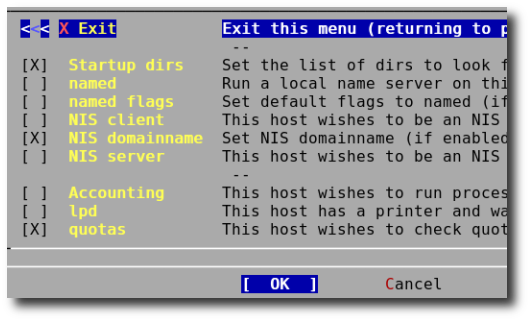 The file rc.conf contains descriptive information about the local host name, configuration details for any potential network interfaces and which services should be started up at system initial boot time. You can edit file manually to remove entries. It is recommended that you use sysinstall utility to modify the /etc/rc.con file. Select Configure (Do post installation menu) > Startup (configure system startup options) > Use [Space] or [Enter] key to select / deselect services / items from a menu > Ok to save the changes. to bind it to the localhost only. I prefer it that way. Thanks for pointing out information. The faq has been updated. when I edit rc.conf, there was mistake I’v made. As you can see above. I forgot to write ‘”‘. It have not been resolved yet. Just type /bin/sh and enter it will boot the system. Mount the partition if not mounted and edit /etc/rc.conf file. Reboot again. when I edit rc.conf, there was mistake Iâ€™v made. As you can see above. I forgot to write â€˜â€â€˜. 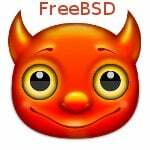 How do I install FreeBSD kernel source code?